I graduated from PT school with nothing to my name except for a big bill of over $150,000 in student loans. Fast-forward, and I was earning six figures as a new graduate physical therapist and even more in year 2 and 3! This is my “about me” article. 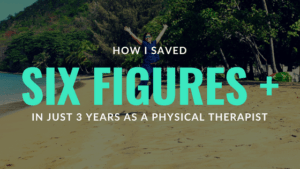 I didn’t want to have some boring about me page, so instead I’m giving you my story and also a detailed path as to how you too can become a financially independent, even as a new graduate, physical therapist! 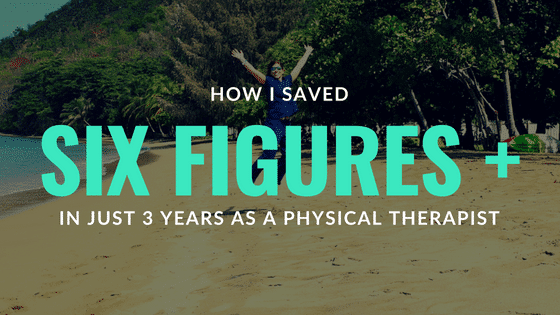 How I saved over six figures in just 3 years as a physical therapist! To me, walking along the carpet at my PT graduation was like a funeral march…. with each step playing “How am I going to pay for this”, step, “how am I going to do this, step, “what did I get myself into” step. I was naïve when I started physical therapy school. I really choose this profession because my love of teaching, helping people, and being active. I knew it didn’t pay as well as being a physician, but I was choosing what I thought was a better lifestyle over more money. In hindsight, from financial standpoint, I really should have found a career path that required fewer loans and that earned more. If you are a new graduate and are reading this, try to find a career path or if you are set on being a PT, really make sure that your school loans are not more than 2x what you would earn each year and ideally only 1x what you will earn each year. For example, physical therapists earn about $70,000 so if I had found a PT school that only cost $70,000 a year, then that would be very reasonable and easy to pay off. I figured out that simply earning $60,000- $70,000 as a new graduate, especially in Las Angeles, California, was not going to cut it for me. This article can tell you a little more about why it’s so tough to conquer your student loans as a PT earning only $70,000, but I really wanted to earn what I thought all PT’s deserved. $60,000 -$70,000 as a DPT too me is a rip off, I could have earned that doing a ton of other jobs without all my schooling and debt. I searched for positions through Indeed, but I put the salary range at $70,000 – $100,000. Go big or go home right!? In the search bar, I performed several different searches, such as physical therapist and high paying physical therapist. I also did not want a big commute, so I also filtered the jobs within a 15-mile radius. My professors really never educated my class on alternative professional routes, such as traveling PT, home health, per diem, or contract work. And so when I started to search for positions, especially high paying positions, I came across a majority of these alternative routes and really didn’t know what to do. I read over many of the job applications several times. Almost hitting submit my applications, but then almost not submitting, just because I had never really been educated on what a contract therapist or what a travel therapist did. But I took the leap and dared to go outside of the safe zone of permanent PT positions. I applied as new graduate for all sorts of positions – with reason of course. Even if I thought some of the job applications were too go to be true, I still applied. You can always interview and ask more questions. I try to never judge a book by it’s cover. If you never submit to a position, you’ll never know if it is good or bad. I’m so glad I took my leap! I really did score my dream job as a new graduate. I was able to work with amazing veterans and earn $85,000 a year as a new graduate! And I only worked 40-hour weeks with no weekends required! My productivity was very reasonable and I didn’t have any take home-work too! What kind of job was this that paid so well? This was a contract physical therapist position. What is Contract Physical Therapy? What is contract therapy? Contractors work short-term contracts, usually 1 year contracts, at a facility but through a contract organization. For example, I work at HealthSouth but I work for X staffing corporation. You often get paid more a contractor because many permanent positions come with 401K plans and fancy healthcare plans which cost a lot of money, but as a contractor, you wont get these fancy plans. It’s ok though! Many contract companies will still provide you health insurance – it just may not be as fancy- and you can still independently invest in an IRA for retirement contributions. As a single and young therapist, I really didn’t need all that fluff, so taking a higher salary really benefited me. I also performed per diem work once a month and on the holidays to further improve my PT skills and supplement my income. In total, my earnings were roughly $100,000 for my first year after PT school! And I wasn’t killing myself! It was simply all about smart career choices! I immediately paid off all of my credit cards first. This is important because credit cards charge you often 10-15% interest and so you don’t’ want to have high balances on your credit cards. 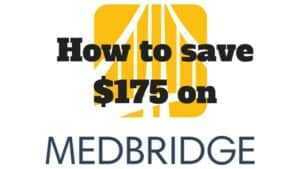 This will also improve your credit score as well! I also made sure every bill and my student loans were on auto-payment. This insures you’ll never have late fee’s or missed payments. I also made a hard copy and electronic copy of all my work paperwork as well as all of my loan paperwork. So I’m going to tell you my biggest regret. After graduating, I didn’t make an action plan and I had no clue what to do with my loans. 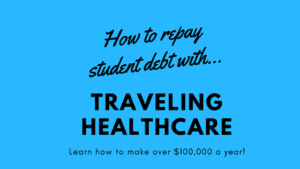 These are really the only 2 choices you have, as all other choices will leave you spending potentially thousands of extra money over the life of your loans (see this article to stop wasting thousands on your PT student loans). But, without any clue what to do, I put myself in PAYE which is the lowest charging loan plan and I simply paid the minimum payments. To me, this is a good plan if you don’t know what to do right now, because it’s affordable and it will let you figure your career route until you really know how to tackle your loans. I really wish some one would have spelled out with no B.S, how to choose right option for me to tackle my loans. 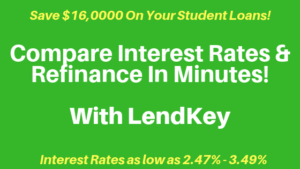 As a result, I actually decided to take it upon myself and so I made a free “understanding your student loans” email course which you can get here, that will help walk you through the steps to understand what you can do today to get a handle on your PT student loans. I was happy as a clam with my first position as a PT. I was able to walk to work, I had great hours, I had great co-workers, I loved my patients, and my boss was pretty normal! I was really feeling like I was making my mark and that I was settling down. Unfortunately, my boyfriend graduated and found an amazing opportunity on the East Coast. I was torn with what to but I decided to follow him out from California to New York! In the months leading up to going to the big apple, I applied for tons of different positions. I had some promising phone interviews, but no position really wanted to offer me a job without interviewing in person. That was going to cost me several thousands of dollars and I really didn’t want to spend that money on a job option that wasn’t even a guarantee. This is when I stumbled across traveling PT. Just with contract work, I was really hesitant to try something new. Once again, know one had really mentioned traveling school, and none of my peers were travelers yet. I was really nervous doing a career route that I knew nothing about and that I had no support system for. But I needed work! So I started making calls to travel companies and started doing my own research. I actually had to call 4 different companies before I found the right travel agency. Some companies were really under bidding me, and some were not responsive at all. I will always remember my first travel interview. I had just flown to the east coast with no car and no apartment. My boyfriend and I had just several days to secure an apartment before all of our belongings would arrive! So in between apartment hunting and figuring out the east coast, I was doing phone and in person job interviews. It was SO STRESSFULL! I actually literally had given myself irritable bowel syndrome – which made things even worse, because I was worried I would have to go to the bathroom during my interviews! I did my first travel PT interview on the bed in the hotel room. It was for an acute care position and I was nervous I wouldn’t get it because I really didn’t have much experience. The interview felt fast but I thought it went well. I think 2 days later, I found out that I got the job! If you want some tips on how to interview for travel positions or even interview travel companies, then check this out! My first travel assignment was in a New York level one trauma hospital. I was the lead therapist on the orthopedics floor and I saw between 6-10 patients a day. What did it pay? $1750/week after taxes, health insurance and my 401K contributions. So that’s about $2000/week pre tax or $104,000 a year! What was really great about this assignment was that there were several other travelers. 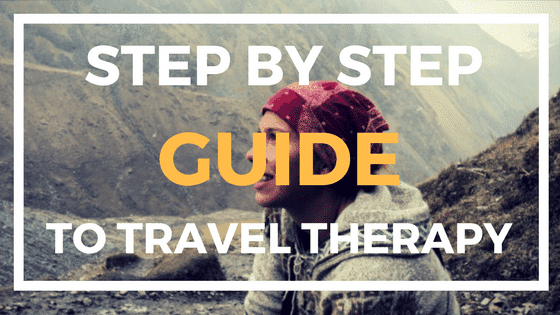 Having other travelers to personally discuss traveling with was a blessing, and I was able to learn so much! Like, I learned that I didn’t have to work weekends because it wasn’t in my contract and that I should negotiate a raise if I extend again at the assignment. These travelers really put my mind at ease about traveling. Now I really lucked out and found a great travel assignment. You can read more about what to look for in travel PT assignments here. From a professional development standpoint, this position was great as well. I was able to become a proficient acute care PT, and I was able to float to all the various floors and work closely with a team of over 10 PT’s and 10 OT’s. The other thing I really enjoyed was tag teaming with the OT on the orthopedic unit. She would get the patient up and in the chair and then I would walk with them and do the stairs. If we had complicated patients, we would co-treat and this is where I really learned what occupational therapists do. This is also where I grew to admire that profession more. Credit Card Rewards: I have also earned several hundred dollars in rewards through getting a new credit card every 6 months to a year. For example, if you get the Chase Freedom Card here, you get $150 after you spend $500 in 3 months. You were going to spend $500 over the next 3 months on food or internet and tv, so might as well get paid to do so! This also helps me help more therapists conquer their loans! I know it can be scary to take these leaps and that is why I have created 2 Facebook groups to help you and give you support and advice with your next steps. And I’m always here if you have an questions. Feel free to email me or facebook message me any time! Good luck and I hope you see how it is totally possible for you to do this too! If you think other PT’s would enjoy this article, simply click the image above to share to Pinterest!